STAVED COLUMNS SAVE WOOD Here a column is glued and compressed out of vertical grain old growth redwood. Photo by Fagan Design and Fabrication. The downward spiral of lumber quality caused by over harvesting of old growth forests deprives all millwork producers of premium material but none are more affected than producers of large turnings for exterior work. Because turned architectural elements expose grain to the weather in every direction, they require material of exceptional stability and durability. New growth lumber can be well suited for many applications, but due to its low annual ring density, it has only a portion of the rot resistance of old growth lumber. By understanding how custom wood turners cope with this scarcity and by developing new tastes and standards for use of more readily available material, thoughtful designers continue to specify serviceable, cost-effective turnings within these constraints. The destruction of these vast sheltering groves is a sobering achievement and one of special significance to builders because of the major role this wood has played in the covering and ornamentation of buildings in America. Substitute materials are on the market but the cultural attachment to wood is so persistent that they can appear glaringly out of place. This preference has helped to create a flourishing popular market for production of turned period columns, porch parts and finials that seems indifferent to the short life expectancy of new growth turnings in highly exposed exterior applications. Whether benefiting from a willful denial of present reality or from a more conscious nostalgic recreation of a better, more abundant past, these reproductions meet a need, they are affordable and there is plenty of second growth forest from which to make replacements when they fail. Their popularity further illustrates an eagerness for solutions that fit the budget and look the way they are supposed to look, in the present. This trend towards diminishing expectations is useful to note when designing in an environment of diminished quality. For more exacting custom reproduction elements, however, a realistic acceptance of the limited service of new growth lumber is becoming evident. According to custom column builder Jay Fagan of Fagan Design and Fabrication, Inc. in West Haven, Connecticut there has been a dramatic reduction of orders for exterior, paint grade columns over the last ten years as a segment of the market seeks more durable, affordable solutions. Growth in their stain grade interior work, however, has more than made up for the loss and they are confident that there will always be some exterior historic and new construction projects which will find a way to assemble the budget to recreate traditional forms in traditional materials. To make the most efficient use of scarce resources, Fagan’s columns are turned from a staved blank, constructed from a ring of cambered staves glued into a cylinder. The staves are oriented directly outward, presenting their most durable face to the weather. Taken as a whole, the assembled blank is of uniform stability and thus more easily turned than a solid or glued up blank which presents a full range of grain orientations. The staving technique allows relatively narrow widths of stock to be incorporated and thus makes efficient use of material. Traditionally used for producing large columns, the technique produces a lightweight, strong structural element with a useful interior chase for structural or mechanical installations. Although labor intensive, as lumber costs go up Fagan finds staving to be a cost effective option for smaller and smaller columns. Jay Fagan observes that over the last half dozen years he has seen the overall cost advantage of staved elements over solid increase. Formerly, in any diameters under 8 inches, solid blanks held the price advantage over a staved turning whereas now he can turn a column as small as 4 inches at a lower cost than that of producing a solid element of comparable quality. More even than columns, decorative finials turned out of wood require the highest lumber grade to furnish durable service. Unlike columns, which are integrated into and protected by the building structure, turned finials are solid, freestanding sculpture. Richard Swartwout of New England Woodturners in Andover, Connecticut is able to turn solid finials up to 18” on a custom built lathe. Solid construction presents natural grain orientation, including vulnerable end grain, directly to the weather in every direction, including upwards. According to Richard Swartwout, the performance of such elements is decided by lumber selection. Domestic old growth redwood has for some time been the standard choice for durable exterior turnings and while reserves have become scarce and expensive, imported mahogany and Spanish cedar are furnishing serviceable substitutes. He builds glueups from vertical grained lumber sized 8/4 to 12/4 but prefers the smaller sizes because they give the millworker more control over selection, grain orientation and placement of glue joints. He notes that compromise of lumber quality will directly accelerate rot. Elements built from old growth stock will outlast any other material, but if it is absolutely essential to cut costs on these finials, it may be more cost effective to build them out of materials other than wood. JUST CHECKING Solid white oak columns season in place. “Checking”, cracks that develop as wood dries, is part of the look for this country estate. Photo by Eric J. Smith, Architects. New England Wood Turners and Fagan Design recently collaborated on a custom design that they agree showed new uses for available resources. 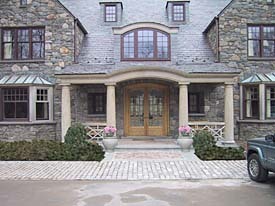 As part of a renovation of a large stone residence, they were asked to fabricate twenty Tuscan columns out of solid white oak for use in a new porch and entrance designed by Eric J. Smith, Architects, from New York City. The column shafts were fifteen inches at the base by ten feet in length tapering to twelve inches in diameter, classically proportioned and furnished with capitals and bases. It was further specified that the shafts were to be turned from green timber. The artisans protested that such a large solid column turned from unseasoned material would check severely as it cured and were told that that was the idea. It was intended that the column should season and weather naturally, in place, and remain unfinished except perhaps for a coat of oil or oil stain, once the material had fully air dried. Thus assured by the architect that the checking process was an intended part of the design, the team of artisans proceeded, even though they felt the material was better suited to a timber frame project than to a classical column. 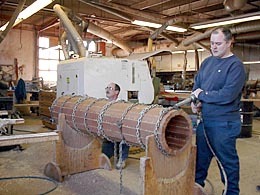 New England Woodturners managed the project and Fagan Design executed the turnings. The stock was selected from cants cut in Michigan and sawn into octagons suitable for turning at broker Goodfellow Lumber’s mill in Delson, Quebec. Before shipment to Fagan, the octagons made a stop at a boring specialist, each to receive a two inch hole up the center to aid seasoning and thereby to relieve the stress of checking. The turning itself turned out to be routine, with none of their concerns about the unseasoned material causing cracking or unbalancing of the work being realized. Once turned, the surface quickly dried to a shallow depth allowing it to be sanded out to a very smooth finish. The bases and capitals were glued up and turned out of kiln-dried white oak to match. Despite initial misgivings, the production team felt that the columns worked quite easily and were very pleased to put their names on the result. Delivered in May of last year, the architect reports that checking of about 3/8” has so far appeared, well within the intended range. How durable these columns will prove over time will depend in part on their exposure to weather and building runoff. Their cost effectiveness will be determined by their as yet unknown length of service balanced against their low initial cost, about $2,000 each, negligible maintenance costs and against their classic, elegant appearance. Jay Fagan is so far impressed and anticipates that his company will get further orders for “rustic” columns. He believes the approach is an affordable, reasonably durable solution to furnishing custom classical ornament for many projects. List of Custom Wood Turners. This entry was posted in Reproduction and tagged Connecticut, Lumber. Bookmark the permalink.